Victoria, Mahe (Seychelles) – January 22, 2018 (travelindex.com) – We speaks of Assumption Island of the Seychelles and the need to keep Military Bases out of the region. 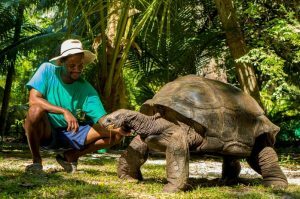 It also addresses the importance of Assumption Island for the UNESCO World Heritage Site of Aldabra. Quote of the week is seeking a refocus:- Winners focus on winning and the losers focus on winners.